Murre, a 31 foot Far East Mariner ketch, is currently cruising the Pacific. Her route, recently extended, will take her from her home port, San Francisco, California, down the coast and into the Sea of Cortez for the winter of 2011. In the spring she will depart for French Polynesia and spend a few months wandering her way toward Tahiti. From there she will depart for Hawaii in the fall and home to San Francisco in late spring of 2012. Total distance to be cruised–around 10,00 miles. Randall Reeves, Murre’s crew and logkeeper, is along for the ride. Bravo Feaerless Sailor; Thank you for all your beautiful writing, especially “The Moon”. How was the Jambon et fromage crissant? Bonne j’espere? Randall, where are you now?? Thinking of you all the time and praying for a safe voyage! Diane – this is Joanna. Unfortunately Randall can’t reply when he’s at sea. Just sent updates to his blog. However, you can always see where he is by clicking on the “Where is Murre” tab and following the link to the map. He’s on his way from Bora Bora to Hawaii at the moment. Wet but doing well. Good morming Sir , we are MRCC PAPEETE (Maritime Rescue Coordinating Center) in French Polynesia. 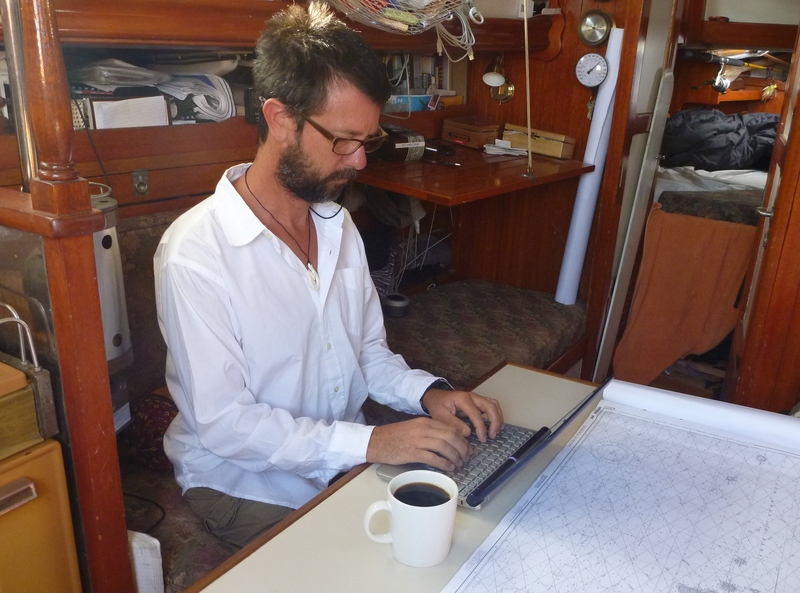 We permit to send you a message on your sailing’blog because we have an overdue concerning the sailing vessel QWAVE and we know that you had a contact with Mr Jajko in 2011. You exchanged conversation with this sailing vessel on Septembre 2011 so is it possible for you to tell us which channel or by which means of communications you had contact with him ? It is necessary that you contact us quickly because we are going to send,in the next days, rescue airplane. My name is Michael. I guess we met once upon a time on a bus heading out of Honolulu City. You were on your way to a polynesian musuem/society of sorts, i forget. You gave me your card and I have only now had a look at your blog.Anyhow I see that you are now in Sitka and that you have made safe passage over the north Pacific, congrats! The reason I write is because I am in Tofino, just south of you and if your stopping by here for a few days it would be great to say hi and see your boat and show you a few local sites. I live with some great guys and we all surf if your interested in getting in the surf. Either way congrats on your safe passage and movements closer to home. Hey Michael, sorry for the late reply, and yes, of course I remember you. The Honolulu buses were freezing, as I recall. Just departed Wrangell for Ketchikan, so am taking my own sweet time getting south. Still very undecided whether will go left about or right about Vancouver Island. Left about means no Tofino. If I stop in Tofino I will be sure to give you a buzz. I have no information on QWave. I only ever met the yacht via radio, and this was on our joint cruise from Mexico to French Polynesia in 2011. QWave made landfall at Nuku Hiva a week before Murre made landfall at Hiva Oa. After their landfall I did not hear from or of them again. Thanks for visiting the Macumbeira blog ! About Robin Knox johnston and the Suhaili picture. I just grabbed it from the web. You can find it when googling Knox – Johnston + suhaili on google pictures. I do not know where the original is. Maybe in Robin’s own living room ! Fantastic your round the world trip ! Many thanks for the note. I was able, with your hint, to find a print distributed by the artist.